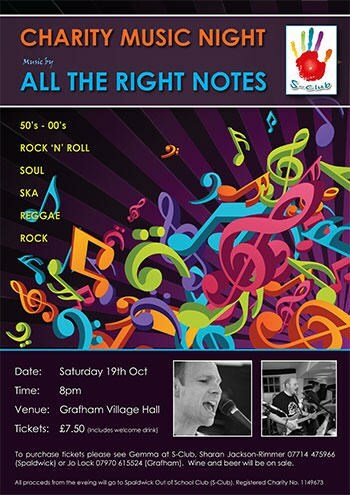 Come and enjoy listening to All The Right Notes at a Charity Music Night being held on Saturday 19th October from 8pm in Grafham Village Hall. Tickets cost £7.50, which includes a welcome drink. You can purchase tickets from Gemma at S-Club, Sharan Jackson-Rimmer in Spaldwick (07714 475966) or Jo Lock in Grafham (07970 615524). Wine and beer will be on sale. All proceeds for the evening will go to Spaldwick Out of School Club (S-Club). Click on the image (to the left) to view the poster.